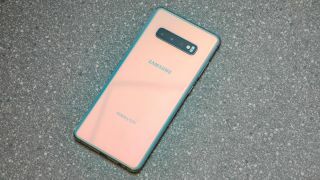 While Samsung only recently launched the Galaxy S10 range, it isn’t done announcing exciting handsets, as a phone with a pop-up camera that serves both the front and back of the device is also widely rumored. But while we thought this would be called the Galaxy A90, it now looks like it might be the Galaxy A80. That’s based on mention of a Galaxy A80 (with the model number SM-A805F) found by Mobielkopen on an official Samsung website. That more or less confirms such a phone is on the way. Plus, the site that it was mentioned on is aimed at Latin America, which suggests the Galaxy A80 might be announced at Samsung’s April 10 event, as São Paulo is one of the three locations that’s being held in. Mobielkopen also spotted that model number on the HTML5test website, revealing an aspect ratio of 20:9, so this is seemingly going to be a very widescreen device. None of this tells us that the Galaxy A90 and Galaxy A80 are one and the same of course, but we’ve heard rumors in the past that they might be. Having said that, mention of the Galaxy A90 has also recently been spotted on a Samsung website, suggesting that actually these might be two different phones. Or that confusingly they might have different names in different regions. Regardless, at least one of them probably has the aforementioned pop-up camera, with lenses rumored to include a 48MP f/2.0 main one, an 8MP f/2.4 secondary one and a ToF (time-of-flight) one for depth sensing. Other rumors point to a 6.7-inch screen, possibly with a 1,080 x 2,400 resolution, a mid-range Snapdragon 7150 chipset, and a 3,700mAh battery. So this isn’t likely to be a top-end phone, but could pack camera features that no top-end Samsung handset offers. We’ll be reporting live from the April 10 announcement, so we’ll let you know for sure soon.